IPC brings together a financial community of 6,000+ that spans most asset classes and types of financial markets participants. IPC collaborates to make them secure, productive, compliant and connected. IPC turned its focus onto their PR in Asia Pacific in 2013, and signed Pink Tiger Media as their official PR agency. The goal was to increase IPC's media coverage in the APAC region since the primary focus was mainly targeted at the US and EMEA. Even though IPC has offices around the world, they all share its undivided attention across the regions. As IPC’s official PR agency for the APAC region, we are constantly engaging with the media in the region for proactive pitching and to grow the media relations as part of our PR strategy in increasing IPC’s exposure and visibility. 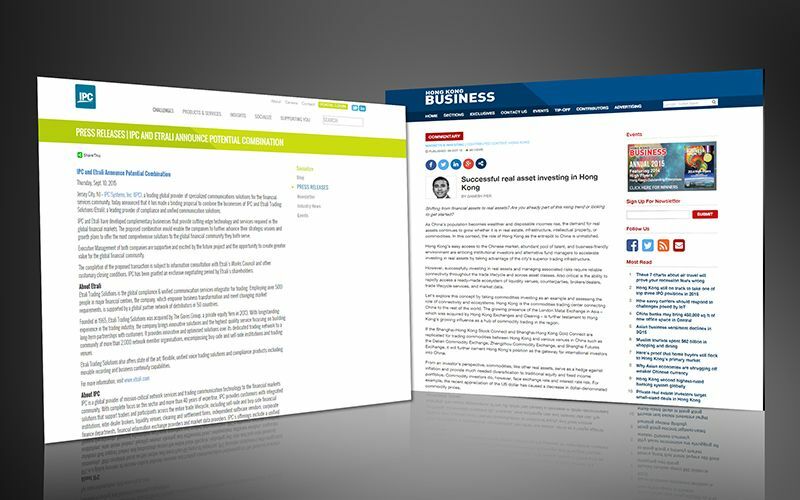 We have been drafting and distributing more and more press releases with IPC’s recent growth after its rebranding efforts. Since IPC engaged us in 2013, we have increased IPC’s media coverage in the APAC region by at least 75%.